The video shows a "moving still life" in photographic resolution. It is presented on a wall mounted flat panel display. 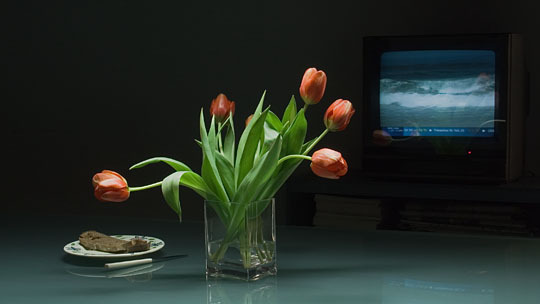 On a table there is a vase of tulips, which grow, bloom and fade during the ten minute movie. Next to it resides a plate with a piece of bread, which dries up. In the background there’s a tv set showing a surge with a stock market ticker at realtime. At some point a moving light illuminates the dark scene for about half a minute. In the video several contradicting levels of time are shown at once. It is the result of a computer controlled setting being photographed over the period of about two weeks. The work refers to the so called "Tulipomania", supposedly the first stock market crash in history. Title "on-time" = the time, that something is (switched) »on«.